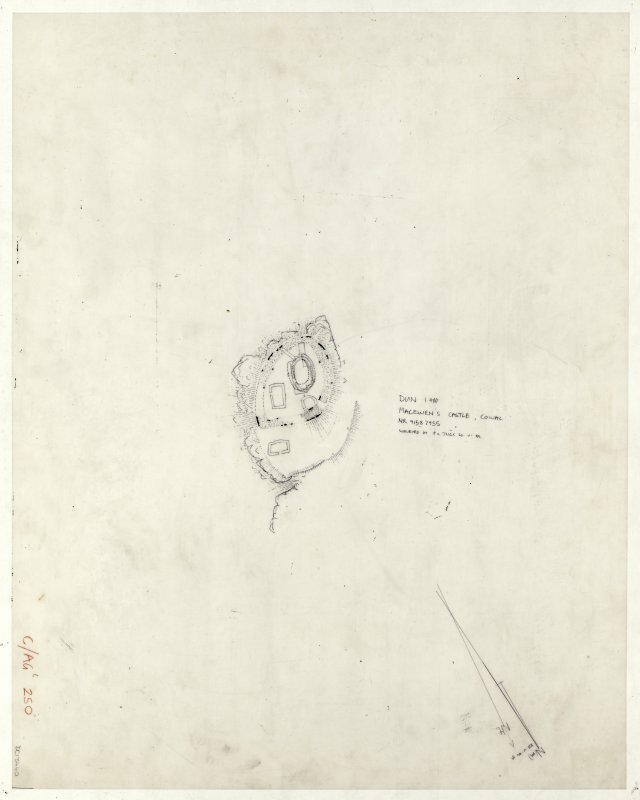 Plane-table survey, site plan: Dun, Macewan's Castle. 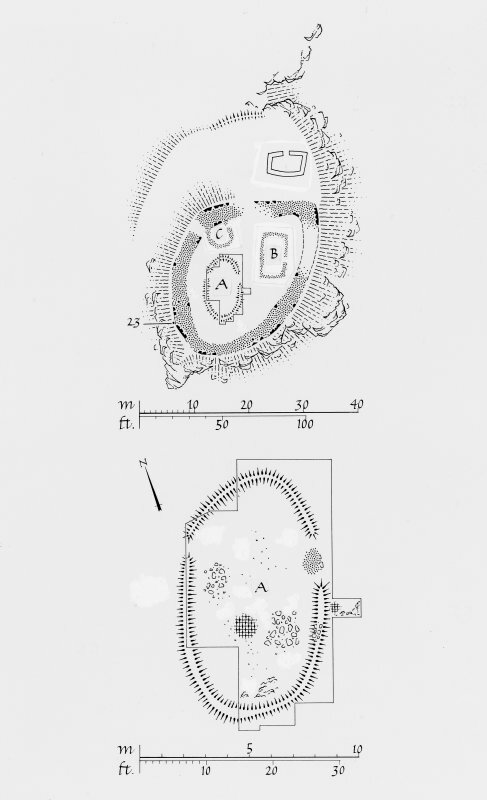 Publication drawing; Dun, Macewan's Castle, site plan and excavation detail. 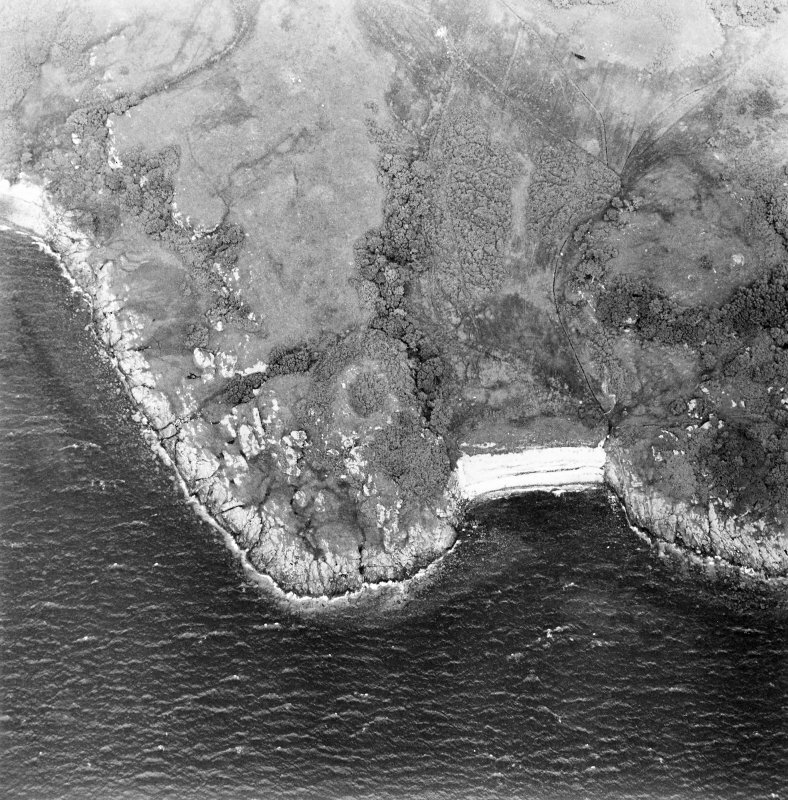 McEwan's Castle: Excavations carried out here in 1968-9 by the Cowal Archaeol Soc showed the earliest structure to have been a palisaded enclosure, which was succeeded by a promontory fort, enclosed by a timber-laced rampart, which was later used to form part of the defences of a medieval homestead. 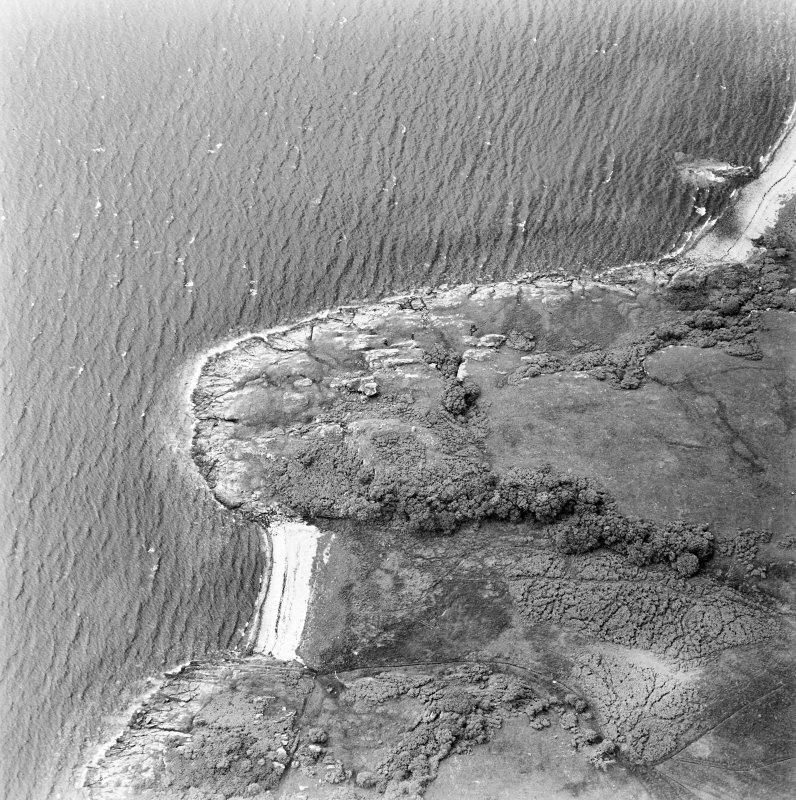 The overall measurement of the structure is 70' x 90', with an annexe below and to the W. It is situated on top of a rocky headland from which blocked passages lead to the shore on the N and S.
Two series of post-holes were found under the medieval buildings; one set, similar to the palisade holes, were mostly cut in rock and natural soil. The others, much more solidly constructed, indicated a 30' diameter hut, probably contemporary with the rampart, in which traces of vitrification were found. The remains of earlier walls appear to have been adapted by the medieval occupants for their defences, edging them with massive rectangular stones. A carbon-14 test on charcoal from a post-hole found outside the rampart in 1968 gave a date in the first half of the 15th century. There were two buildings within the rampart, one, turf-walled, measured 35' x 21', while the other, stone-built, measured 24' x 21'. Also, in 1969, a round house built against the rampart at the gateway, with a firmly cobbled floor, was uncovered - possibly a store house. A roughly boat-shaped building outside the main rampart was also uncovered. No artifacts were found to date these structures. Unstratified finds included an 12th century crucifix (J G Scott 1993), a 15th century groat, and 13th and 18th century pottery sherds. All finds were to be sent to Glasgow Art Gallery and Museum. Mrs Christian 1963; Cowal Archaeological Soc 1968; I Christian 1969. An oval dun measuring 21.0m NE-SW by 17.6m within a wall up to 3.5m wide and 0.8m high. There is no indication of an entrance and no trace of the annexe noted by Mrs Christian. The remainder of the site is generally as described. 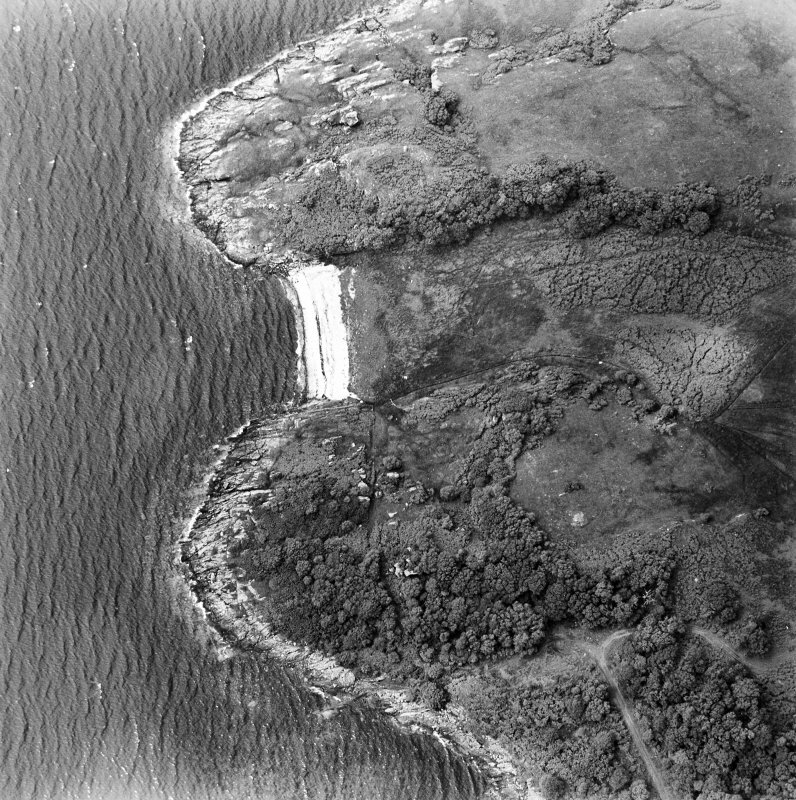 Visited by OS (I A) 17 November 1972. On a rocky promontory at the E end of Kilfinan Bay and 1.1km WSW of Fearnoch, there is a ruined dun known as Macewan's Castle or Caisteal Mhic Eoghainn. 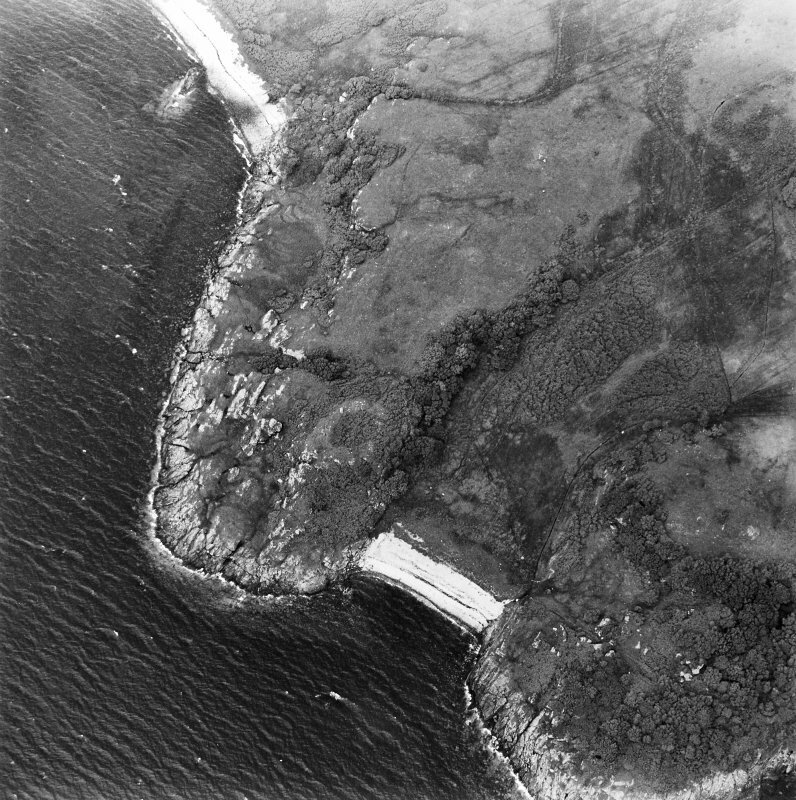 Exacavations undertaken in 1968 and 1969 examined the dun wall in several places and revealed a series of internal buildings (Cowal Archaeol Soc 1968; Christian 1969), most of which are of medieval or later date and thus fall to be decribed in Volume 7 of RCAHMS Inventory (RCAHMS 1992); these features are shown in simplified form on the plan (RCAHMS 1988). The dun measured about 22m by 20m within a stone wall 3m in thickness, but the N and NE flanks have been robbed to provide building-material for a series of later structures. Intermittent stretches of outer and inner facing-stones survive on the W and S. The entrance was probably situated in one of the gaps in the wall-debris on the N. On this side additional protection was afforded by an outer rampart or wall, which was drawn across the neck of the promontory some 14m to the N of the dun. Excavation revealed small lumps of vitrified material in many parts of the dun wall, and the excavators had the impression 'that the walls had been timber strengthened rather than timber laced'. Two post-holes cut into the underlying rock or clayey subsoil (nos.1 and 2 on RCAHMS plan) have been interpreted as the remains of a free-standing palisade, but they are more likely to represnt traces of timber framing within the original wall or else of refurbishment in the medieval period. Post-hole 23, which provided carbonised material for a radiocarbon determination of ad 1530 + - 70 (GaK -2046), measured 180mm in diameter and 100mm in depth and was packed with small stones. several post-holes (nos 3-8) found within the dun were 'small and slightly built', and most were cut into the natural clay subsoil or into rock. Larger and more substantially constructed post-holes formed a second group (nos 16-20) which may be part of a timber house at least 9m in diameter. Another clearly-defined post-hole was found a little to the NW. The occupation associated with the post-holes was represented by dark soil conatining pieces of burnt clay, possibly daub. Finds included part of a pitchstone armlet, a fragment of lignite, and quartz and stone objects. The later structures include the base of a turf-built wall, a well-built rectangular stone house, a circlar stone building abutting the dun wall on the NE. Finds from the later periods include a crucifix of 12th-century date. where it incorporated the inner face of the disused rampart. undateable, and may be of the post-medieval period.